Very sweet old fashion vintage play toy. Dates late 1920’s or early 1930’s, the graphics of the box shows a little girl making cookies. 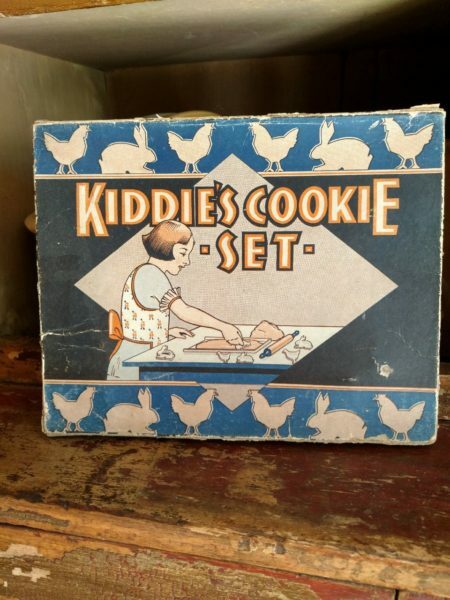 A children boxed cookie pretend play toy Depression era set. Original graphic box, the old set consist of a metal tin chicken and rabbit cookie cutters, baking sheet and wooden handled rolling pin. The rolling pin is natural wood with green handles. Border of the box features the rabbit and chicken cookie cutters.